We have released the Sipdeed AI forum area, where we will publish relevant resources from time to time. You are welcome to ask questions and exchange in the forum area. It integrate USB2UART chip, auto download circuit, RGB LED, DVP Camera FPC connector(support small FPC camera and standard M12 camera), MCU LCD FPC connector(support our 2.4 inch QVGA LCD), TF card solt. MAix BiT is able to adjust core voltage! you can adjust from 0.8V~1.2V, overclock to 800MHz! After much searching I found the resistor that connects bank 6 and 7 to 1.8v. How do I switch banks0-5 over to 1.8v as well? Hi there, If you want set bank 0~5, you need set R3/R4 to change 3V3 to 1V8. For more info, please refer to https://bbs.sipeed.com/t/topic/649/2 thanks. Sipeed newly provide breadboard-friendly board for you, it called MAix BiT. 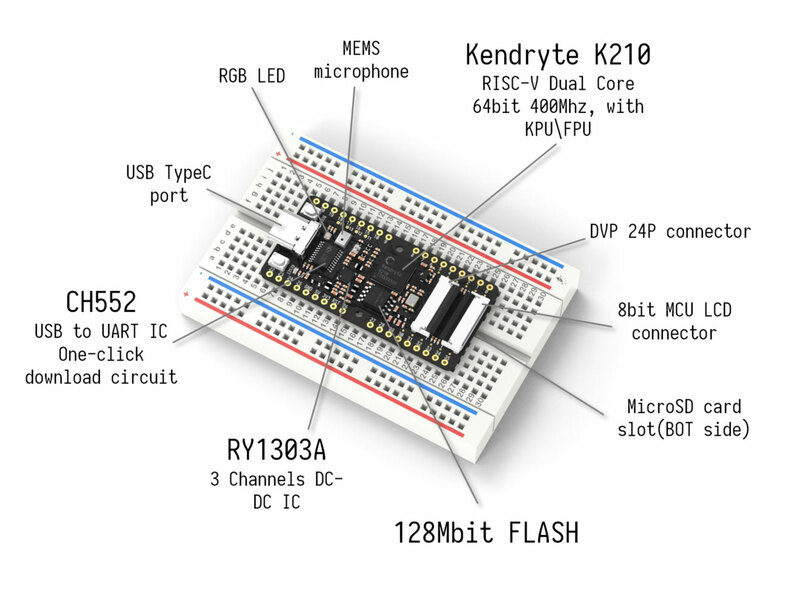 It integrate USB2UART chip, auto download circuit, RGB LED, DVP Camera FPC connector(support small FPC camera and standard M12 camera), MCU LCD FPC connector(support our 2.4 inch QVGA LCD), TF card solt.